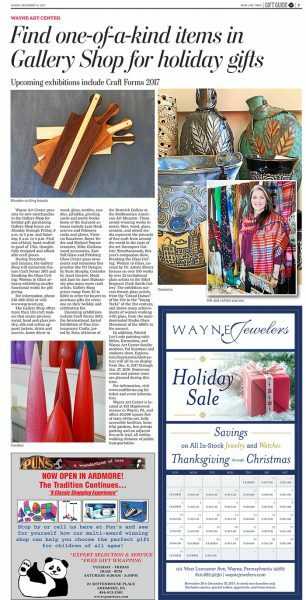 “Wayne Art Center presents its new merchandise in the Gallery Shop for holiday gift purchasing. Gallery Shop hours are Monday through Friday, 9 a.m. to 5 p.m. and Saturday, 9 a.m. to 4 p.m. Find one-of-kind, hand crafted in good ol’ USA, thoughtfully designed and affordable craft pieces. more than 150 craft makers that create precious metal, bead and glass jewelry, silk and cotton apparel jackets, shirts and scarves, home décor in wood, glass, textiles, candles, giftables, greeting cards and poetic books. Some of the featured artisans include Leni Hoch scarves and Polonova socks and gloves, Victoria Kavalerov, Royce Yoder and Michael Smyser ceramics, Mike Giuliano wood accessories, East Fall Glass and Pittsburg Glass Center glass ornaments and numerous fine jewelers like PO Designs by Susie Murphy, Croisoles by Janet Gossow, Mack and Jane by Jane Makransky plus many more craft artists. Gallery Shop prices range from $5 to $500 in order for buyers to purchase gifts for everyone on their holiday and celebration list. Upcoming exhibitions include Craft Forms 2017, the International Juried Exhibition of Fine Contemporary Crafts, juried by Nora Atkinson of the Renwick Gallery at the Smithsonian American Art Museum. These award winning works in metal, fiber, wood, glass, ceramic, and mixed media represent the pinnacle of fine craft from around the world in the state of the art Davenport Gallery. glass artists in the Ethel Sergeant Clark Smith Gallery. The exhibition surveys female glass artists, from the “Grand Dames” of the 70’s to the “Young Turks” of the 21st century, and shows many achievements of women working with glass, from the male dominated Studio Glass Movement of the 1960’s to the present. member, Val Rossman and students show, Exploration/ Inspiration/Abstraction will all be on display from Dec. 8, 2017 through Jan. 27, 2018. Numerous events and patron tours are planned during this time.